Kristalina Georgieva is the European Commissioner for International Cooperation, Humanitarian Aid and Crisis Response. Before joining the European Commission in February 2010, she have held various positions at the World Bank, including the posts of the Director for the Russian Federation and the Director for Sustainable Development. 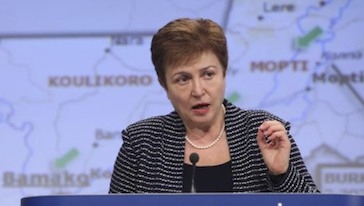 Georgieva was appointed the Vice President and Corporate Secretary of the World Bank. Georgieva obtained PhD in Economic Science from the University of National and World Economy in Sofia where she also worked as an associate professor.